These old fashioned gooseberry pie recipes are fun to try. 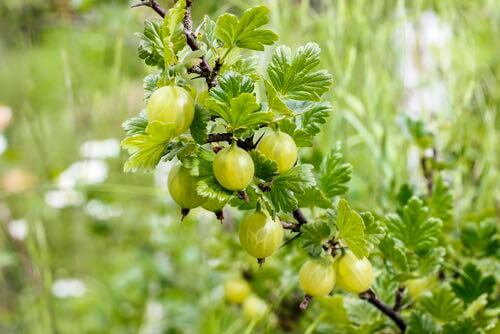 Gooseberry lovers find these tart, sweet-tasting berries are simply wonderful in pies, tarts, and jellies. Gooseberries are one of my of my favorite pie flavors, but as a child I never enjoyed picking them because their bushes were so prickly. Gooseberries are so flavorful. They're an excellent source of vitamin C and are said to contain 33% of the recommended daily intake. They can be enjoyed when ate raw as-is though they tend to be sour when picked early. 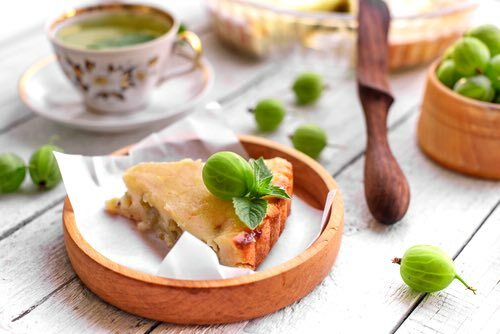 Remove tops and stems from one pint of gooseberries; wash, add one-half cup water, and cook about fifteen minutes, or until soft and well broken; add one cup of sugar, and cool; line patty pans with paste, fill with gooseberries, cover with narrow strips of paste to form a lattice. Bake in a hot oven (425°F) twenty-five minutes. To recipe for Gooseberry Patties above, add two tablespoons of dried and sifted crumbs. Roll paste one-quarter inch thick, cover a pie plate, trim the edge evenly and moisten edge with water; fill with gooseberries, cover with half-inch strips of paste placed half an inch apart to form a lattice top; trim the edges neatly, moisten and finish with a half-inch strip of paste around the edge. Bake about forty minutes. The oven should be hot for the first fifteen minutes (425°F), and then the heat should be reduced to 350°F. Pick off the stems and blossoms of your gooseberries, wash them, and pour enough boiling water over to cover them. Let them stand a few minutes and then drain them. Line your pie plates with paste, fill them with the fruit, and add three-quarters of a pound of sugar to a pint of fruit. Dredge a little flour over the top and cover with a top lid of paste, leave an opening in the center to permit the steam to escape, and bake them. Add 1 quart of sugar to 1 quart of gooseberries and put into a baked crust. 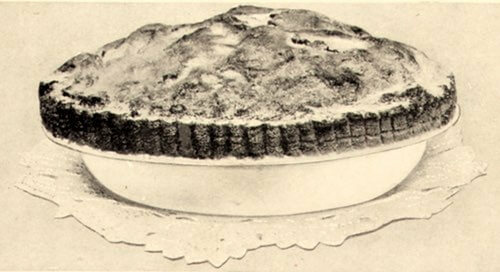 Cover with pastry and bake, or the pie may be baked without a top crust and a meringue added after baking, returning the pie to the oven to brown the meringue. Look over the gooseberries to remove stems, and stew slowly, with enough water over them to keep from burning, until they break, sweeten well and put aside to cool; pour into pastry shells, and bake with a top crust of puff paste; brush all over with beaten egg while still hot; put in the oven for three minutes to glaze. Roll puff paste out thin, cut out with a cookie cutter, press into gem pans, a teaspoon of jelly (see recipe below) in each and bake till done. Wash the gooseberries, put them in a preserving kettle with the water and cook over a slow fire till the berries are soft enough to mash easily; strain, and press through a jelly bag, and to every pint of juice add one pound of sugar. Cook rapidly for ten minutes, skimming well while boiling. Turn into glasses, and seal when cold.